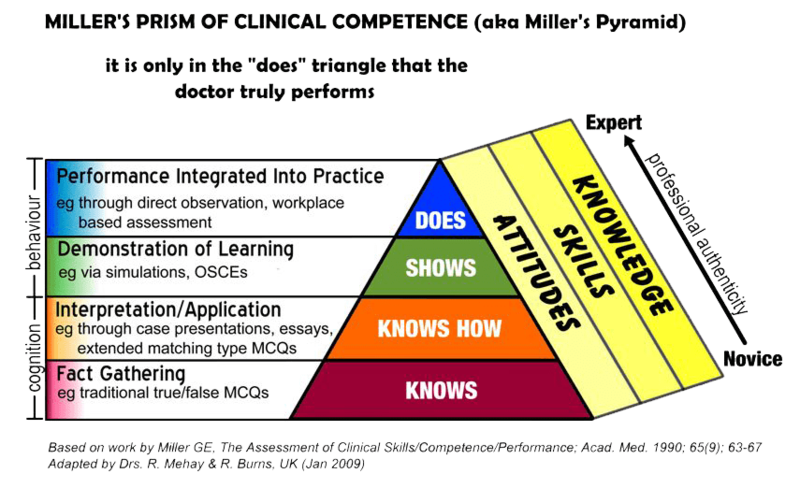 Miller’s pyramid (1990) is a way of ranking clinical competence both in educational settings and in the workplace. As a framework it distinguishes between knowledge at the lower levels and action in the higher levels. It argues that to truly know whether our learners are achieving what we want them to achieve we should assess them in the setting that we expect them to be delivered. This rationale underpins the concept of assessment in the workplace and the various tools and fashions that have developed around that in the last decade. Of course not everything can be assessed in the workplace and in emergency medicine we struggle to be able to be in the right place at the right time to observe rare events. Other methods such as simulation are then potential tools to assess at the higher levels of the pyramid. Here at St.Emlyn’s we are advocates of in-situ simulation as we believe that it blurs the boundaries between DOES and SHOWS (although technically it is within the lower level). Miller’s ideas strive to define education by it’s outputs and not by it’s inputs. At the end of any teaching intervention we are interested in what learners can do, which is not the same as what we have taught them (think about it for a second). The higher levels have greater professional authenticity. Miller’s pyramid is usually described as having 4 levels; knows, knows how. shows how and does. Additional levels before these have been added to suggest that learners need to have heard about and have awareness of before knowing. Many commentators would stick with the original 4 levels. In recent years the pyramid has found a third dimension to incorporate the domains of Bloom’s taxonomy. As a 3D structure incorporating attitude, cognition and psychomotor domains we can see how and when we can assess learners for competency. In a similar manner to Bloom’s taxonomy the pyramid helps understand what it is that we are testing and asks the question as to whether our assessments are valid. It makes us strive to make our assessments as valid as we can. #LP The higher we assess on Miller’s pyramid the more valid the assessment. Rent tuition classroom Singapore with all facilities to obtain good knowledge.